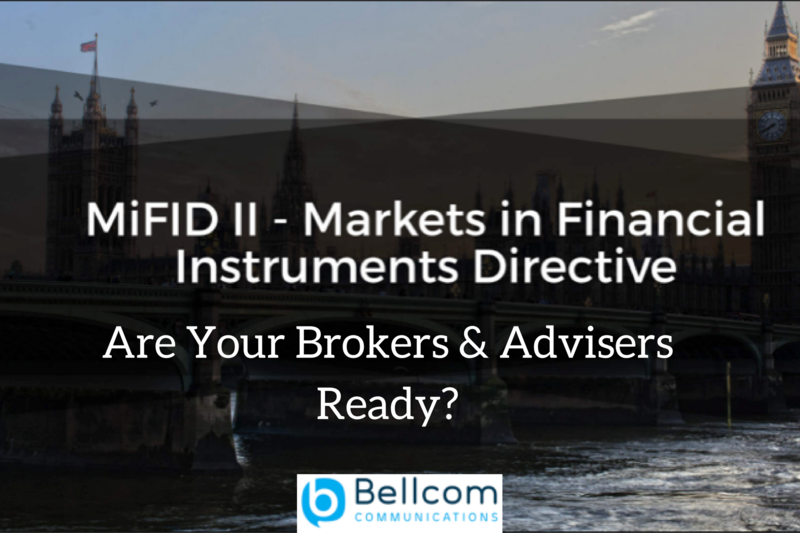 MiFID II (Markets in Financial Instruments Directive) is the EU legislation that regulates firms who provide services to clients linked to ‘financial instruments’. The rules which came into force on 3rd January 2018, cover virtually all aspects of trading within the EU and reach across the financial services industry, from banks to institutional investors, exchanges, brokers, hedge funds and high-frequency traders. Buried within MiFID II is a regulatory desire to push more trading away from the phone and on to electronic venues, which come with better audit and surveillance trails. That will mean a wave of data as banks and brokers will be forced to show that they offered customers the best available price for their trades. Brokers and Advisers are also required to detail how the advice they offer meets their clients’ objectives and display whether it is based on a broad or restricted analysis. Invariably not every financial services provider can operate solely in electronic venues. Fees disclosure includes a significant proportion of brokers and independent financial advisers, many of whom deliver their services from offices or while on the move, usually via telephone interactions. All firms will have to take all reasonable steps to record relevant telephone conversations, electronic communications and face to face meetings, which relate to actual or possible transactions, both for clients and on the firm’s account. The records must demonstrate any terms of any orders placed and will be used to detect any market abuse. Firms will need to keep the records for at least five years, sometimes seven years or the duration of the relationship with the client. The reality is that many telecoms networks and equipment are woefully inadequate to enable businesses to comply with the new regulations. A good example is a requirement to for full separation of work and personal identities of regulated employees on their mobile devices. Thus personal calls and SMS should never be recorded while always recording Work calls and SMS. VOIP, or “hosted” telecoms, is another area that apparently ‘modern’ telecoms fail because some of the businesses believe VOIP calls over mobile phones are MiFID II compliant. Typical VOIP telecoms are inadequate as MiFID II requires all recorded interactions to be in a format that is usable by the regulator. You cannot make VOIP calls on mobiles everywhere there is a phone signal, so users can only make unrecorded non-compliant calls outside of data coverage. Even if there is data coverage sufficient to initiate a VOIP call, data contention with other users on the mobile network or Internet often mean poor quality calls. Add to this the high compression used to make VOIP calls in many circumstances then it can be difficult to understand what is being said on a call, resulting in the call recording quality being inferior and unusable and therefore, non-compliant. The low quality also makes it is impossible to run voice to text analytics for more detailed searching and automated case reconstruction. 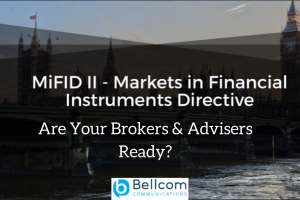 It is therefore vital to ensure that your business telecoms are compliant regarding functionality and connectivity to enable you to meet your obligations under the MiFID II legislation. 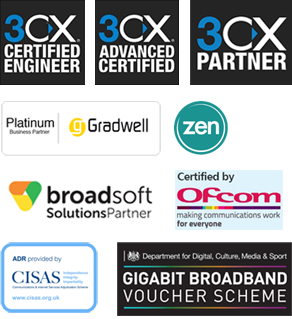 So, what are your options with regards to telecoms on both your fixed and mobile telecoms? Bellcom Communications offer both Office and Mobile Voice telecoms systems which have been specially developed to meet increasingly stringent legislation as smoothly and efficiently as possible. Included in our office phone systems as standard and also designed to run on any mobile network using our VSmart™ system which captures and records all voice calls, voicemail, text and instant messages sent to and from your mobile device. Our telecoms solutions help companies and their employees turn legislative requirements into business opportunities. MiFID II is here now and will increasingly take hold over the next few months and years. With MiFID III already on the way, the requirements and duties on brokers and financial advisers show no signs of slowing down or being reversed. Businesses must recognise that their obligations under the regulations and explore the right telecoms solutions that will enable them, not just to be compliant but also to utilise their telecoms to increase credibility, trust and thus more business from investors. If you are in any doubt as to whether you should be recording your communications or how, contact us for advice while there is still time to put in place plans.